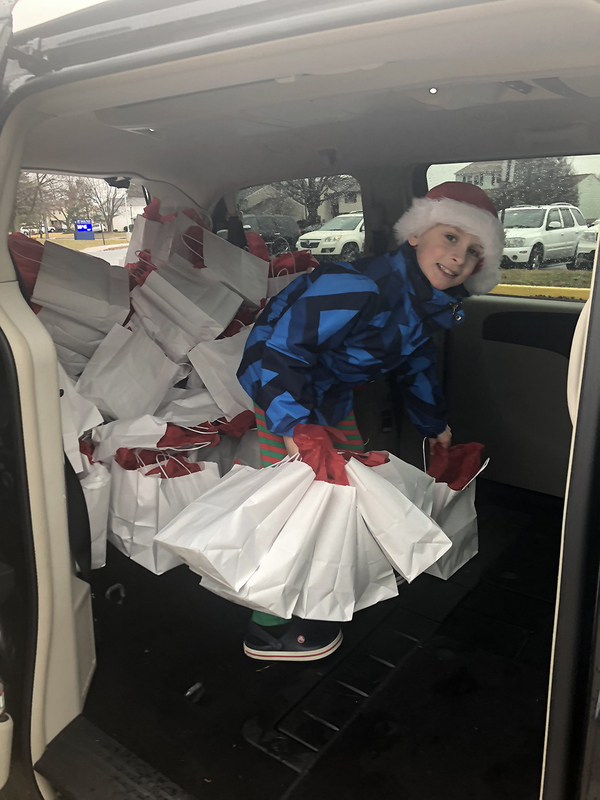 Eight-year-old Enzo Vincent collected 3,500 pairs of pajamas for children in need this Christmas. The card, which he helped to design, is signed with a heart and his name. Each donor also receives a thank you card for their donation. “He said it was never about 3,000 pajamas. It was about 3,000 children … He teaches us a lot,” said his mother Danielle Vincent. 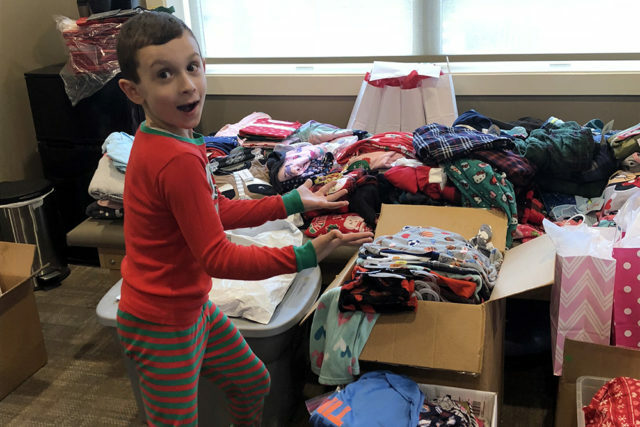 She calls schools each year to find out who could use a pair of pajamas. 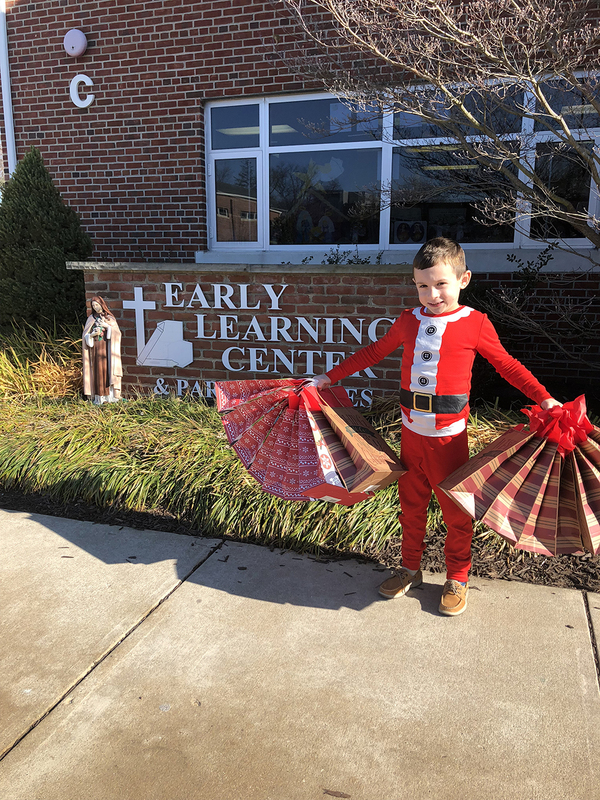 Then the pajamas, collected over about eight weeks, are distributed in schools throughout Delaware. As the program has grown, he has begun collecting pajamas from as far away as Texas and Canada. His parents make space at his father’s chiropractic office for “Enzo’s Workshop” in what has become a family affair. “This has become our Christmas,” she said. “I am going to try to go national and try to get somebody to do it in each state,” he said. He surprised his parents with that goal for 2019 on live television in an interview on ABC. 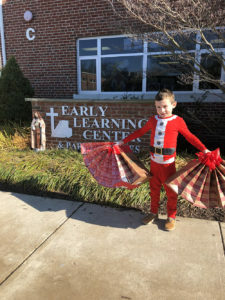 He won a Jefferson Award for his efforts in 2018. 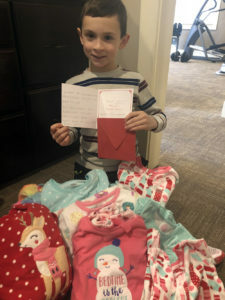 Danielle said it’s one of many nice things her son tries to do for others, including giving out water on hot days, making cupcakes for the homeless, using his own allowance to buy books for children in the hospital, giving out flowers, buying balloons and even helping throw birthday parties for the residents of the local men’s shelter. She said her son was inspired by the story of Padre Pio. “He wanted to help others. He was poor when he was a kid and he wanted to help others,” he said. When a school friend wasn’t eating his lunch, Vincent’s parents found out it was because their son was buying him lunch. “My friend is hungry and I can’t let him be hungry,” he said. “He’s still an eight-year-old kid … He’s very serious, but he’s fun. He just has a big heart,” she said. When he isn’t collecting pajamas, Enzo likes playing soccer, singing, playing the piano, swapping lunches with his sister and cooking, including Bobby Flay’s meatballs. Mom and dad try to limit television and video games for Enzo and his sister, five-year-old Livia. She said his long-term goal may be building homes for the homeless. “If everybody prayed the Rosary each day, then we could have peace in our world,” he said. His family tries to be supportive, as does Holy Cross. “That’s what we want to teach our children, to appreciate the work of others,” she said. 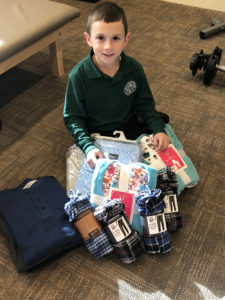 Holy Cross said students could have a “Pajama Day”, if they could collect more than 300 pairs of pajamas for those in need. They flew past that goal, so “Pajama Day” happens on Jan. 25.